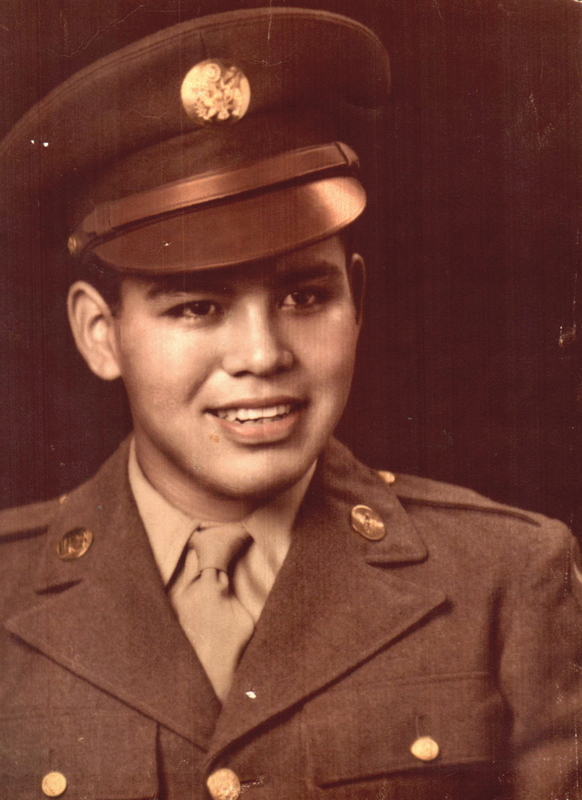 Valentine Villanueva, M/Sgt, USAF (ret) joined the US Army Air Corps in June, 1943. He served in WWII as a flight engineer and top turret gunner on a B-17 with the 8th Air Force, 447th Bomb Group, 710 Squadron in England. On November 25, 1944 his plane, the “Blonde Bomber”, was hit by flak during a bombing mission over Germany. Although wounded and burned during the explosion and resulting fire, Val was able to get his severely injured pilot out of the aircraft moments before the aircraft disintegrated. He was captured, interrogated and interned at Stalag Luft 1, POW camp on the Baltic Sea in Germany. Conditions at the camp were extremely harsh and food was almost non-existent. He and two fellow POWs successfully escaped in April, 1945. Aided by Russian troops and a commandeered horse and buggy, they were repatriated with US forces and returned to the States. He continued his Air Force career serving as a flight engineer on several aircraft and as instructor at the USAF School for Latin America in Panama. He served again in England as a missile instructor and finished his active duty career as an aircraft missile instructor at Lowry AFB in 1965.